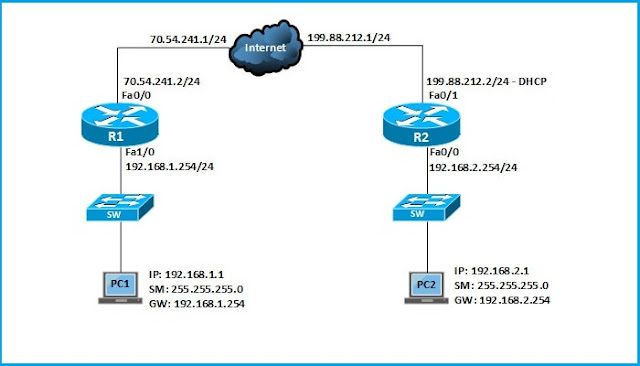 Cisco IOS routers can be used to setup IPSec VPN tunnel between two sites. In this article, I will show you the steps to Configure IPSec VPN With Dynamic IP in Cisco IOS Router. This VPN configuration is different from Site to Site IPSec VPN with static IP address on both ends. The scenario below shows two routers R1 and R2 where R2 is getting dynamic public IP address from ISP. R1 is configured with static IP address of 70.54.241.1/24 as shown below. Both routers have very basic setup like, IP addresses, NAT Overload, default route, hostnames, SSH logins, etc. There are two phases in IPSec configuration called Phase 1 and Phase 2. Let’s start the configuration with R1. Before you start configuring the IPSec VPN, make sure both routers can ping each other. I have already verified that both routers can ping each other so let’s start the VPN configuration. Step 3. Configuring Extended ACL for interesting traffic. This ACL defines the interesting traffic that needs to go through the VPN tunnel. Here, traffic originating from 192.168.1.0 network to 192.168.2.0 network will go via VPN tunnel. This ACL will be used in Step 4 in Crypto Map. Note: – The interesting traffic must be initiated from PC2 for the VPN to come UP. Step 4. Configure Dynamic Crypto Map. Above command creates a crypto map that will be used under the interface configuration. Above configuration creates a dynamic crypto map named IPSEC-SITE-TO-SITE-VPN with sequence number 10. If you have more than one remote site with dynamic IP address then you can configure additional dynamic map with different sequence number, say 20. For example, crypto dynamic-map IPSEC-SITE-TO-SITE-VPN 20. Step 5. Apply Crypto Map to outgoing interface of R1. Step 6. Exclude VPN traffic from NAT Overload. Above ACL 101 will exclude interesting traffic from NAT. Step 4. Configure Crypto Map. To test the VPN connection let’s ping from R1 to PC2. As you can see, the ping from R1 to PC2 is successful. Don’t forget to ping from inside IP address while testing the VPN tunnel from the router. You can also ping from PC1 to PC2. To verify the IPSec Phase 1 connection, type show crypto isakmp sa as shown below. To verify IPSec Phase 2 connection, type show crypto ipsec sa as shown below. This is how you configure IPSec VPN With Dynamic IP in Cisco IOS Router.